Another super-production which is to spread the word about an apocalypse. Given that 2012 is nearing, I am not surprised that more and more works with a similar subject appear. Even though, according to my spirit guides, what the fate of the world will be is still unsettled, there is no end to the number of catastrophe-theories coming from self-proclaimed prophets, which, in turn, provide script writers with a wide range of stories to choose from. Knowing begins as a very promising film - at least for me -, but, unfortunately, it then switches to a cumbersome slur of dilettantism and superficiality. Of course, despite this, it is a usable movie. There are very important scenes and elements in it, but what was left out could have given to it much more. If its creators had paid a bit more attention to certain facts, then it could have become an epoch-making work, which would have contributed to the understanding of the world to an enormous extent. In 1959, in the yard of a newly opened primary school, they bury a time-capsule into the ground. The capsule contains drawings made by children about how they imagine the future 50 years later. One of the girls, who turns out to have quite a disturbed mental state, instead of a drawing, gives in a sheet of paper full of numbers. It can be seen that while she is writing down the numbers, she is in a hypnotic-like state, in a trance. This phenomenon is called automatic writing. Automatic writing can happen in trance - as it can be seen in the film -, or in a totally conscious state. The person who receives the messages of the spirit world in trance usually does not remember later what he or she wrote, and is not able to explain what it is he or she has "brought down". 50 years later, when the time capsule is opened, the girl’s letter ends up with the lead character’s (Nicolas Cage) son. The boy is slightly hard of hearing, and what is more, lost his mother only a couple months ago. Hearing damage and an inflammation of the ears are always the result of some mental trauma. This can mean that the person has had enough of what he or she has to hear, or, on the contrary, they block their hearing because what they hear is not what they would like to hear. 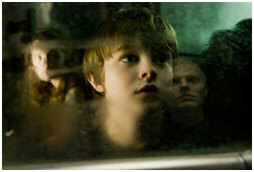 It is a pity that it is not worked out in the film when the boy’s problem has started. It could have been a great example of how a developing human seedling can shut out the outer world if they do not want to hear something - in this case, the sentence that his mother died. If it was rather a birth defect, then, too, the explanation could be the same. It is because the soul who is to be born already knows what will happen to him or her in the course of their life. For instance, the fetus here could already know that he will be orphaned and did not want to hear about it, or he could know well that his father, with his scientific explanations, would go against the laws of the Universe, and so the boy rather did not want to hear his "argumentations". 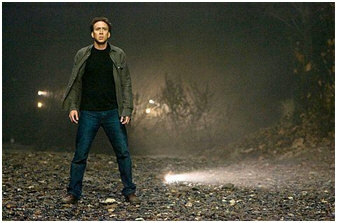 Cage portrays an astrophysicist in the movie, who is always arguing against the theories of determination (pre-calculability) and randomness (accidentality). Left-brain hemisphere dominance is obvious with him. Everything is governed by the intellect, and not emotion. The Higher Will might have taken away his wife just because of this, so that he, at last, realize that life has such areas as well where logic is not worth a penny, and there are situations which can be handled exclusively with emotional intelligence. Children are not moved by logic, it is emotion which they are missing - understanding, tuning-in and love. Our scientist’s knowledge is very much put to test when his son takes the row of numbers home accidentally, which his father accidentally catches sight of, then the spot made by the glass falls accidentally just where the date of 11th September 2001 can be found, and, the lead character is, accidentally right then, just feeling like having a look at all the other rows of numbers, too. It turns out that what he sees are the exact dates of the biggest catastrophes of the recent past together with the number of victims and the exact geographical coordinates. Is it indeed "accidental", or is there some direction of the powers above in it? The lead character finds of course those data as well which relate to the hotel fire one year ago, where his wife was among the victims. Then, strange "lurkers" come into the picture. Tall, blonde figures wearing trench coat, who do not say a word, only watch. They could also be found in one of Cage’s earlier film successes, City of Angels, where they were identified as angels, but here, these mysterious beings were given an entirely different role. As a side note, City of Angels is full of unbelievably good and unbelievably misunderstood representations as well, just like the German Wings of Desire. It happens that, next to certain people, their dead relatives are present, who help the particular person (they are always beautiful), or need help (they have the appearance of their decomposing body). It is not a necessity that the souls of the dead should be present, however, lately there are more and more of those around whom not everything was right when they departed, and so their soul has stuck here. About them, filmmakers have already made a lot of series. Who have not yet ever been shown authentically, though, are guardian angels. Everyone has a guardian angel, it is just that the law of the Universe that they must not intervene in the life of their protégés unless he or she asks for it, and that they can help only in such a matter that they ask their help in, applies to them to a much higher extent. As they are present mostly as a bright and radiant energy, many think them to be optical illusions or a part of their protégé’s aura. By the way, it is true for their appearance, too, that they can show themselves only if someone has definitely asked for it. An exception to the above is when their protégé’s life is in danger but his or her time of departure has not come yet. Then, and only then, they can intervene. In every other case, they comply by the rule that they make their presence felt only if someone has asked them to do so. Well, the mysterious beings portrayed in the films above do not possess angelic attributes, and do not comply by these rules, either. As they are portrayed, I must say that yes, there are beings like them, too. They are the observers. Neither bad, nor good. They do not belong to anyone, do not want to convince you of anything, they do not teach, do not intervene, they are only present. I myself sense them at times as well. There are activities when their lurking does not bother me, for instance, when I hold a meditation session for others, or when I am healing someone. However, in certain, more intimate situations, I do send them away. Fortunately, they have to fulfill such requests. From a human perspective, they cannot really be used for anything, but they are harmless. In City of Angels, too, there were such lurkers. It is a pity their status was not shown unambiguously. In a humorous vein, I would say it was apparent that it was not clear even for them themselves whether they would be angels, humans, or some "others". But let us look at the lurkers of Knowing. I have already mentioned in several of my writings that there are several extraterrestrial species who are regular visitors of our planet. When they approach me, I usually turn them away because I find it very difficult to determine unequivocally the honesty of their intention, and once I open the gate, I cannot know whoever else they will bring with themselves. When they first sought me out, I asked them to show me what they want through my dreams, and that they should not visit me in person. However, one day curiosity won over me and I asked them to show themselves to me, so that I could get to know their physical form. And they came one after the other. Every night, a different species showed itself when I was already in a slightly hypnotic state, but still awake. As in those three days all my electronic devices broke down one after the other, I gave up and after the fourth species, I did not want any more of them. There was someone who had a gas-like appearance, another who had a snake-like one, but there was also a group whose members looked exactly like the aliens in Knowing. Tall, with blindingly blue eyes, who appeared very cold-blooded and rigorous. They, too, felt my aversion, so they did not disturb me anymore. I can totally picture them being capable of how the aliens in the film kidnap the children from their loved ones, because for them, necessity has priority over emotional bonds. The age group which was "chosen" in the film for survival is, however, entirely unauthentic, because children under 10 are absolutely immature for a life on their own. In my opinion, the scene where the beings left them alone on the planet shocked a lot of women. I personally freaked out from the thought how much terror and starvation they will have to go through, even though the creators of the film must have wanted to suggest rather the chance for hope to viewers. It is a misconception that spoiled urban children who have not eaten anything but preserved ready-made food and grilled frankfurters in their life would be able to survive. If only they had been at least 12 year-olds, then it could have been a very powerful teaching, since the 12th year of life is the dividing line, and from then on, everybody has to learn to take responsibility for him- or herself. In Western societies, the 12-13th year of life is the beginning of puberty. In natural tribes, this is the age when children must go through initiation rituals, which mean that they become adults. In Free Mason guilds, it was at age 12 that they started training apprentices, which, after 3 years, was followed by an initiation ritual. In the Jewish religion, the initiation for becoming a man, the Bar Mitzvah (or Bar Micva), is tied to reaching one’s 13thth year, whereas in the case of Christians, it is after reaching the 14thth year of age that someone can become full member of the church by Confirmation. In most societies, the legal system sets age 14 as the beginning of competence. At a younger age, a child cannot be indicted yet. If a child who is younger than 12 commits a crime, it is added to the parent’s karma, but after that age, they themselves are responsible for their actions. At age 12, the instinct with which a child can survive already works. In the film, however, they put them out to a golden wheat-field in vain, because at such a young age, they would be unable to maintain themselves. And the missions God gives us are only such that we can accomplish! The situation could have been solved in a way that one adult stays with them, and then we would know that they are protected on the physical level, too, and then we could have been relieved. Also, the situation could have been solved in a way that they "choose" such children who already know something. Like, one helped a lot at home in the garden, another can fish, a third can cook, or, (s)he is someone who knows instinctively how to give first-aid, etc. In these cases, I would have seen some chance for their survival. It could have been solved so that they show that these children are able to tune in to nature and that they know instinctively how to survive in a way that they do not harm other beings. Then, they certainly would not have been hungry, they could have taken shelter from a storm, and wild animals could not have harmed them, either. It could have been done in a way so that we see indeed that there is hope for human civilization to survive. In this case, however, we, women and family-oriented men, seeing the scene, experienced rather terror and a fear for them. In the film, the cliché appears, too, of course, which is another feature of American films, that a woman comes who persists to the end in her "not-understanding" of the man. Why is it the woman again who is hysteric? Is it that in certain societies, there are no normal women left at all? Or the imagination of script writers does not extend this far? My favorite "master", Daniel says, women hear, think and talk, men see, know and react. Ladies! Do you have any idea how silly you look when, instead of thinking, you react? Recently, it has come into fashion that women behave stupidly, and portrayals in films further strengthen this tendency. This way, many believe that this is the norm to be followed. The left brain hemisphere is the seat of logic. This mode of operation is characteristic of men. The centers of seeing, acting, quick reactions and logical thinking are there. The left brain hemisphere bases the future on the events and fears of the past. It focuses constantly on the obstacles and limits. It continuously inquires and is continually finding fault. The right brain hemisphere is the seat of emotions, and is the mode of operation characteristic of women. There is the point of origin of emotion, imagination, intuition, the arts, the ability for tuning in to others, and of sympathy. The right brain hemisphere programs the future in a way that it should be in harmony with the environment, and with everybody and everything. It does not know impossible, and always looks for the most optimal solution. People dominated by their right brain hemisphere are governed by their senses, and therefore know the solution without asking, instinctively. This is what God created us to be like. No matter how strong emancipation is in our age, if we reverse the roles, then we disrupt the energies, and from this, only chaos can follow. According to certain spiritual teachings, Satan always attacks from the left. It is always from the left brain hemisphere where doubt springs up. Because of this, men always question women’s instinctive reactions. Women, then, have started to adjust and have taken up the masculine mode of operation. Of course, in the masculine mode of operation, it is just the essence of their femininity that they have lost, and therefore they have ended up exactly where men have wanted to see them, in an inferior position. Fortunately, life cannot be violated. Women are always born as the Creator intended them to be like, so men have to eradicate femininity from women in every era again and again, which, on the other hand, does not succeed in every case. As I myself lived in a strongly left brain dominated mode of operation for years, I know how difficult it is to accept that emotions and instinct cannot be explained logically. The energy, however, which is natural in a man, turns into hysteria in a woman. Gentlemen! Is it indeed worth paying such a high price only to appear more than women? There are situations where science cannot help, and then it is faith which gives hope. In effect, Einstein said the same: Where science ends, that is where faith begins. Knowledge is the left brain hemisphere, faith is the right one. But will more things be all RIGHT in the world if we become faithless? And is knowledge enough to avoid being put and LEFT in the mud by bad luck? The school system is based on an accumulation of data and leaves little space for imagination. Generally, those count as "cool" who ask a lot of questions, which, in many people’s eye, is the sign of intelligence. If I ask a youngster whether they would prefer to be clever or wise, the majority does not even understand what the expression "wise" means; it is cleverness which is traditionally marked. It is true that the Universe is full of works in which the hero who saved the world achieved this success by his wisdom, but still, everyone puts the clever on a pedestal. Do not misunderstand me, I do not want to portray right brain hemisphere thinkers as beings with a higher intelligence. If everyone felt only, we would still live in the jungle, sing happily instead of working, we would paint our skin and would love everybody. It is not what the Creator’s aim was, and I do not want to contradict the Creator, either. It is just that I would like men to be who their energy predestines them to be. They would create, protect, and produce the goods and the financial means, whereas women would provide harmony, emotional security, and, thanks to their ability to tune in, they would give wise advice to their husband. But of course, not in a manner of talking endlessly and hysterically! In a calm environment, when they can pay attention to each other, when nothing and nobody disturbs them, then, by tuning in to the Universe, their heart and right brain hemisphere will quietly tell them the right solution. How many more times do I have to pray to see a woman like this on the screen at last??? A wise woman, who gives strength for the battle and faith in time of challenges. Who supports with a touch and heals with a hug. Who is her husband’s companion and support in every situation. Who nourishes, coddles, comforts, listens, and forgives. A woman, who is as the Creator made woman to be. Why do I have to feel ashamed when I am watching certain films because my fellow women throw a tantrum when they should support, and reason when they should listen? If a woman has lost the ability to listen and keeps interrupting, if she reacts to everything and wants to comment on everything, and keeps giving admonitions, this is the sign that her life is governed by her left brain hemisphere, which is not based on reality, but only their personal experiences. The point is not that women should not ask questions at all! It goes without saying that in order to clarify a situation, it is sometimes very important for them to ask questions, so that they could check if their instinct was right in what it indicated to them. However, if their asking serves as a substitute for thinking, that is already a little irritating. Men like it when women ask them because then they feel that they are people who KNOW something - except for questions like ’’where were you? ", ’’why did you do it? ", and so on. They do not know, or more precisely, have forgotten that women can give the most confidence and the most energy when they keep quiet. So, I would ask you again, Gentlemen! Is it indeed good if women, too, live their lives according to logic, in which case, no matter what, they will lose? I would like to ask again, Gentlemen, is it really what you want? Do not forget that it goes against the divine will! The Creator has not placed women where you force them to be! As I mentioned, it is not the Lord who rules the left brain hemisphere! As this is the planet of free will, God has given us the possibility to believe from our free will in whatever we want to. It is not a problem if we do not believe in God, he will not get angry with us for this, but in this case, he will not be able to help us, either. He cannot intervene, because we do not believe in divine providence, and he, too, has to respect our choice. Angels cannot manifest for and help those, either, who are governed by their left hemisphere. It is only in complete silence - and I mean a silence inside the brain, a silence where there are no thoughts - when the right brain hemisphere is able to notice these delicate quivers. However, God still trusts in our whole life, putting a lot of challenges in our way, that eventually, we will give up our incredulity and will entrust ourselves to Him. This is what happens to the lead character as well. In this scene, I liked it very much how his priest father had faith that God is well-meaning. We would think that it is just natural that a priest believes in God, but, unfortunately, I must refute this. Those who know my writings are aware of the fact that certain churches are full of priest representatives who have taken on the soutane only in order to be able to practice absolute power, and no other factor played a role in their decision. It is not that they received a calling from God; they just made a logical decision. By looking at their reactions, their behavior in that they often do not wait for the opinion of their superiors, of heavenly envoys or God, and by considering their judgments, it would be easy for us to expose them, but who would dare to stand up against the priests who have been anointed and therefore authenticated by the historical churches, risking that the church would perhaps anathematize them. The father in the film proves his faith in God by not trying to escape from fate, but accepting instead God’s necessary apocalypse. He does not protest against death, rather hugs his loved ones for a last time. Towards the end of the film, Koestler returns to what he tried to deny all his life. When logic does not give any hope, the only logical decision is that we try to believe in God again. In the very last minute of existence, emotions are given way, the man returns to his minister father, so that, in the embrace of his parents and sister, he could wait for his last hour. It is a slightly pathetic scene, but it has a serious symbolic value. In a sublime wording, in the end all of us return to the embrace from where we started. It is a pity that the creators were not aware of the facts mentioned above. By complementing the work with some thoughts, they could have created a movie which, after the screening, would have made people leave the cinema in an uplifted state of consciousness, and which would have made recalling the film a pleasurable experience for them. It would have been enough to insert only a few sentences, and viewers could have felt that they received much - instead of feeling sorry for and fuming about the money wasted on the ticket. I do not know if Nicolas Cage had a hand in influencing the story of the film, and if yes, to what extent, but at any rate, this movie was not a real success, despite the fact that it would not have needed much to be so. Nevertheless, Mr. Cage remains my favorite. That he can play so many types of characters authentically shows that he probably had a lot of previous lives, he must have already endured a lot, and this may be why it is so easy for him to impersonate others’ characters. From a professional point of view, one of the series which are closest to my heart is The Dresden Files (I already wrote about it), whose producer is Mr. Cage. In that series, there are many spiritual truths, and I found almost nothing objectionable in it. That series is already suitable for showing how the world works. I often quote the saying, "nomenest omen". I do not know how conscious the name choice of Cage’s company was, but Saturn Films is a very apt and befitting name if it produces primarily The Dresden files-type of films. My readers who are familiar with astrology know that Saturn is the lord of karma, and he himself is the cause for why we incarnate here. Saturn is responsible for career, but also for making one abide by the rules. He brings the tests, the challenges, and punishes us strictly if we break the rules. I hope that the productions which come out of Cage’s company in the future will be worthy of the name of the planet, and will be productions which we will watch with joy and about which I will be able to inform my readers with satisfaction!